The Third Year is my Interactive Internal Monologue that covers the past few months of my life. These were the first few months of my Third Year of having a job in U.S (Fifth year in total. 2 years as students were all spent completing my Masters). 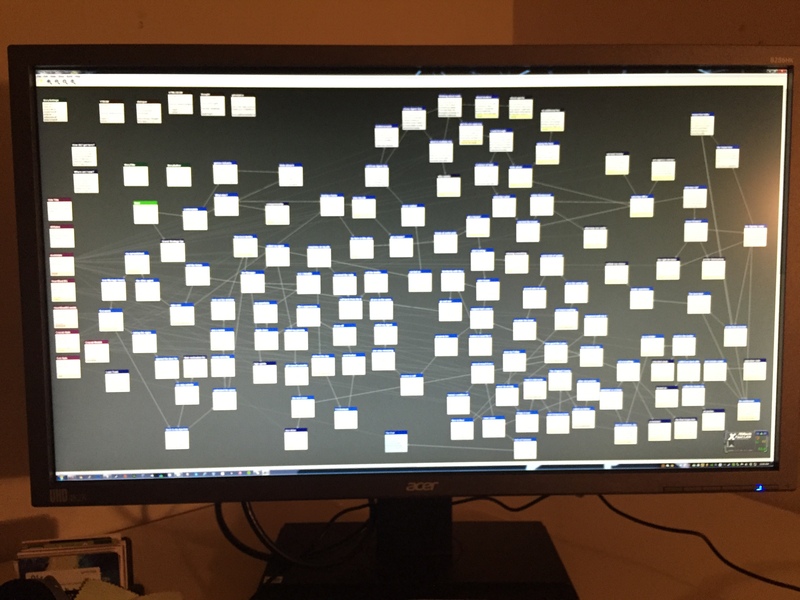 I chose Twine because I knew that this was going to be long, and I wanted to provide a method for reader-editing. Which means that the content is defined by the reader’s curiosity. There are multiple branches and the choices you make as the reader are only for how much you want to know, not how you want the story to play out. As this is not fiction but an actual account of things that happened to me. There is no hard and fast rule where the last link on the page will take you. Everything was done organically, as and when I was writing it and what I felt was right at that moment. This was an exercise of multiple types to me. One as an exercise in creative writing as I went through multiple styles of writing throughout the chapters. It is not to make it incoherent on purpose, but because that is the way I felt that day after the events played out. Most of the early chapters were written a week or two after the fact, collecting all memories and compiling them as I remembered, but as I got closer to the end, things started getting extremely serious for me, and that is when it became a therapeutic exercise to me. After the extremely stressful events of the day, I would come back home and express my raw emotions in writing, much of it were so raw that reading them afterwards, I feel like I would have edited a lot of it out. But I wanted to leave them there because I wanted to record what I actually felt, even if it was what I felt just for a moment, because of the things that I was made to go through. I was being true to my self of that moment. Even though in a more “cool” and “calm” state of mind, those thoughts might have sounded off. I went through the whole thing and corrected basic typos, and then some editing, but later, I felt like too much editing would make it feel manufactured, as this was less about being correct, more about being true. At first I wanted to write this because felt that it would be educational for others who I know are like me, the thousands of Indians from India, coming here for MS in US, and then trying their luck as they ask themselves everyday the question of what is going to happen to their future. I feel that everyone asks themselves the question, if they are going to immigrate to U.S.A or go back home, a big life decision such as that is never known to people for certain until they have lived for many years. I wrote the story initially thinking it would be helpful for such people to understand the process of buying a house in U.S. But then it became more about asking yourself if you really want to settle in U.S permanently or not. What kind of questions come up about the future when you try to do things in U.S. Many might just fly past such events in their life, never worrying or thinking, but I somehow cannot ignore them, I need to acknowledge the inherent conditions of being a possible-immigrant and then make a conscious decision from knowledge. I feel like not highlighting specific parts of what I have written because I feel everything had a meaning and purpose, I however, do not want to define what it was, I have a solid understanding of what I meant, but I feel that people will regardless find a meaning that they see in what I wrote. So it is vain to try and express my explicit intent unless requested. I wrote the last parts of the story with the most amounts of passion, the middle part with the most of amount of detail. I want everyone to read everything, but I wrote it in such a way that they can avoid reading most of it, it was always a hard decision to give people the option to jump around. Writing thousands of words giving an option for them to not read is a unique feeling. The other part of me always wanted to just delete everything and never post it, as it felt it was the most personal writing I had ever written. It was a challenge, and I am writing this even before I have made the story public, only because I feel like automating everything so that I don’t feel like I am putting it out there myself. It is very long, most people may not even reach the end, I loved each and every part of it, I feel the final parts have the most influential things for people like me, however, it is all hidden behind words, it will be a challenge for someone to get there. It is the part with extremely passionate writing; about the corporeal harassment my Lending Bank made me go through, because of their incompetence and my being. This was the part which was written each and every day after coming back home and dealing with the multiple trials that the bank put me through. Every day I felt like it was the final passage, ended it and saved, but every next day I had some new development, it was like the series of events was never ending, not leaving me, not even until the final day. I wanted to put in multiple BGMs, especially a different one for the final part as the tone is drastically different, but chose not to because of the time constraints and priorities. The chosen BGM slightly speaks to that part too in a way, so I did not feel bad about leaving it the way it is. However, the BG pic transformed, an extremely neat and clean, clear, hi-res image when I first started writing, but a lossier image later. Only because when I started, everything looked hopeful for the better, but later clear-yet-not-as-clear-as-it-seems described the whole ordeal better for me. Also, it decreased the file size, as many people that I will be sharing this with would be Indians in India with slow Internet. Many people trying it out will also be first time “game players” I wanted it to be as reader like as possible, as less confusing as possible. That’s why the first passage itself is meant to teach them that each link takes them to a different part and continues the story further. There are many more conscious choices I made in writing everything that was written, the intermingling of my conscious and subconscious created a melodious mood within me that helped me write every day and get through the things that were happening. I contemplated every day if the purpose of me writing was complete after I had written it, as writing it was what provided me with comfort. I contemplated if I should post it to the world outside, now that it is complete, or just stow it away in my eternal digital draft desk. Somehow this had made it to the outside world (I hope) and I hope it is at least a little bit helpful to anyone who reads it, if not, I guess, it is as good as never publishing it, which I am fine with anyways. I have so much more to say about this, but will only if requested, so if you have read it, and have something to say about it, please let me know.